After three months out with a side strain injury, Instonians and Ireland fast bowler Nathan Smith will make his long-awaited return to action against Armagh in the Robinson Services Premier League on Saturday. 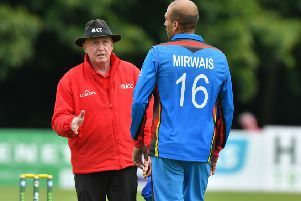 Smith was named in the inaugural Irish Test squad in May against Pakistan, but suffered his injury only a couple of days before the game in training, cruelly ruling him out of playing a part in the historic occasion. The 23-year-old is now in a position to get back on the pitch, and says being limited to a watching role has been very tough. “It’s been brutal to say the least,” he said. Smith has been training with the Ireland Twenty20 squad, who have been involved in a three match series against Afghanistan which they currently trail 2-0, with the last game to be played on Friday before three One Day International’s at Stormont next week. “It’s a good environment to be around, especially with the amount of cricket they are playing at the moment,” he added. The Australian-born seamer has been increasing his training load in recent weeks, and believes he is now back to full fitness. “I’m feeling strong at the moment. “I’m back to full fitness and I’ve been bowling for the past few weeks now to get the overs in and make sure I’m ready for the match intensity. The worst fear for any injured sportsman upon their return is to pick up another one after so long out, and although he is always aware of it, Smith is looking to just focus on the task at hand. He will return to Australia during the off-season to play cricket in the Southern Hemisphere, but before that faces two league games and the possibility of rounding out the season with the Northern Knights. Instonians have had a torrid time with injuries throughout the 2018 campaign which has stopped them competing for the major trophies, but Smith sees the positives that the challenges have brought. “In particular, the last couple of weeks and we had a good win against Muckamore. That is good to watch and see the success of our youth programme coming through. “In that way, it has been successful in growing the club, but in another way you want to win trophies, so that has been disappointing.